But it’s especially common when you’re applying for jobs that require you to make tough choices or work independently. It’s also common in interviews for entry-level jobs. 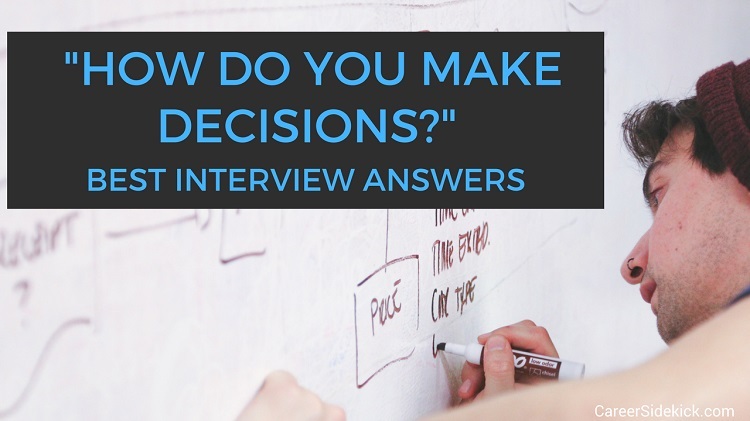 You need to be able to clearly describe how you make decisions. Managers want people they can trust and don’t have to keep an eye on every second. So this question is your chance to put their mind at ease. The goal here is to sound like you have a system or a process you follow. It doesn’t have to be an exact science, but you want to sound like you approach decisions the same way, rather than doing something completely different each time or trusting your gut (don’t reply by saying “I just trust my gut”). This is good advice for pretty much all of the interview questions you face… don’t just say how you’d do something, give examples. 3. Remember- Logic Is King! Your answer might sound a little different than the example above. Whatever you do, just remember that in almost all cases, it’s best to seem logical when you describe how you make decisions. Show that you rely on facts, that you look to gather information before deciding, etc. Don’t sound like you act on emotion or hunches. That’s my best advice here. If a hiring manager asks “how do you make decisions?”… they want to see someone who consistently follows a plan to come to the right choice. If you follow the steps above you’ll have a convincing, impressive answer that completely puts the hiring manager’s mind at ease. You don’t want to leave them with any concern about how you make decisions, and this is how to do it!